Honeywell International, Inc. is an American multinational conglomerate company that produces a variety of commercial and consumer products, engineering services and aerospace systems for a wide variety of customers, from private consumers to major corporations and governments. The company operates three business units, known as a Strategic Business Unit–Aerospace, Automation and Control Solutions (ACS), and Performance Materials and Technologies (PMT). 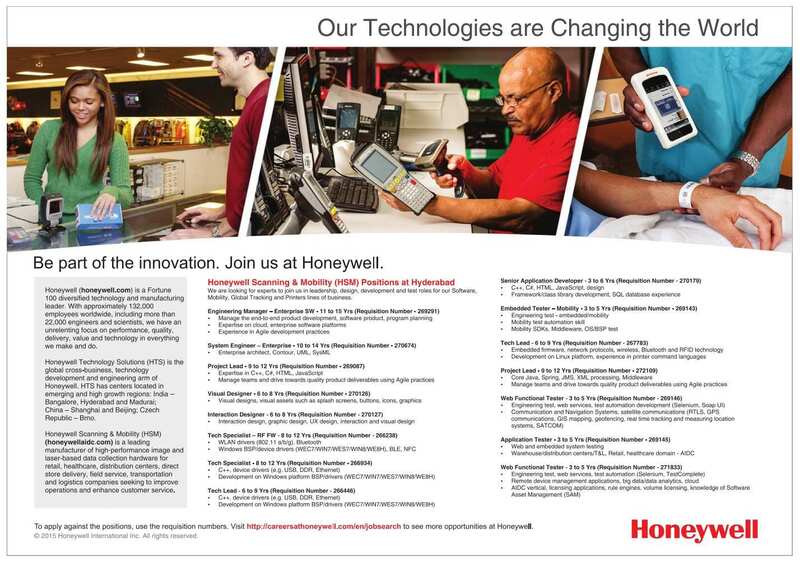 Honeywell is a Fortune 100 company. In 2014, Honeywell ranked 74th in the Fortune 500.Honeywell has a global workforce of approximately 130,000, of whom approximately 58,000 are employed in the United States. The company is headquartered in Morris Plains, New Jersey. Its current chief executive officer is David M. Cote. The company and its corporate predecessors were part of the Dow Jones Industrial Average Index from December 7, 1925 until February 9, 2008. Requirement understanding and analysis Must have. Designing Automated test framework Nice to have.